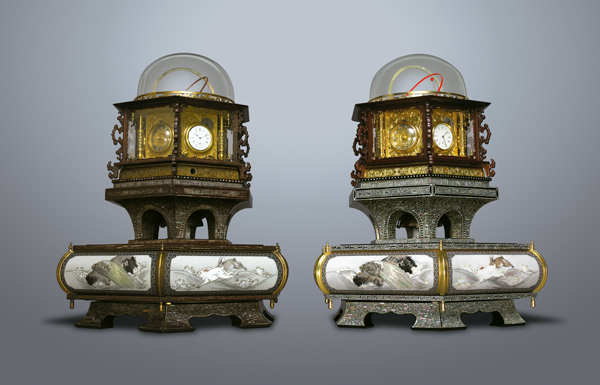 Left: Myriad clock made in 1851 by Tanaka Hisashige. Right: Myriad clock replica made in 2005 by the Myriad Clock Replica Project. On loan to the National Museum of Nature and Science, Tokyo, owned by the Toshiba Corporation. Professor Suzuki Kazuyoshi’s series of three lectures will shed light on the expansion of education, discovery, science and the arts in the Edo period (1615-1868), as well as providing an examination of craft innovation during the period. By the 18th century in Japan, literacy and numeracy were increasingly perceived as ‘essential tools for worldly success’. During the Edo period, regional initiatives encouraged schooling regardless of social rank with educational facilities run by local and religious institutions. Remarkably although the Tokugawa government’s policy of severe maritime restrictions fostered relative isolation in order to preserve domestic culture from ‘foreign influences’, foreign documents and books, often descriptive of new technologies were translated and widely distributed and studied. One interesting example is the introduction of Western clocks and time-keeping technology. This innovation allowing for the standardisation of units of time replaced the old system of wadokei or Japanese style clocks. Wadokei were originally developed from the late 16th century and organised time into six daytime hours and six nighttime hours whose length varied according to the season and time of year. The standardisation of time with western-style clocks had a profound effect on Japan and its modernisation. In this series of Toshiba Lectures in Japanese Art and Science, Professor Kazuyoshi will take an in-depth look at the origins of the Japanese ‘making of things’ (monozukuri) from aesthetics to function during the Edo period and will trace their implications for the present day. Professor Suzuki Kazuyoshi joined the National Museum of Nature and Science in 1987 after a distinguished career in the Research and Technology Development division at NCR Corporations, Japan. His research interests involve the development of technology in early modern to present day Japan through empirical research on material resources in museums and historical archives. He has curated a number of exhibitions, including ‘Medicine and Healing’, ‘Robots’, and ‘Japan International Aerospace Exhibition’. He serves as a member of committees at the Ministry of Economy, Trade and Industry and the Agency for Cultural Affairs and advises public and private sector organisations on museum and exhibition projects. London Lectures: Seats will be allocated on a first-come, first-served basis.